I've owned this rug over two years now. I was it frequently, still looks great after every wash. Definitely worth every penny! Great rug for pet owners. Dimensions 37.0 In. X 5.0 In. X 5.0 In. Another win from Overstock! I'd never heard of this company before but was fascinated by the ability to wash the rug. At this time we have not had to wash the rug so I can't speak to that but will update my review when that time comes. The colors are nice, rug is solid in construction and fit our needs of a low profile rug to fill a space for our elderly dog to not have issues with wood flooring in our home. The two pictures attached offer 1 with flash, 1 without flash. 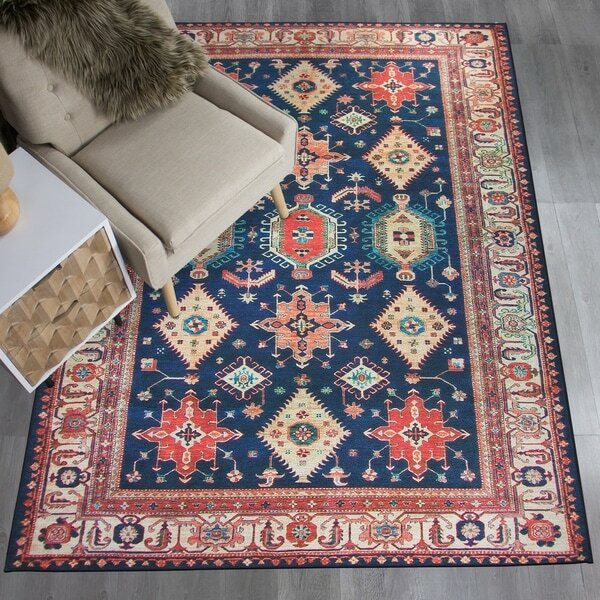 I liked this rug enough after receiving that I've since ordered another larger 5 x 7 ruggable rug, expected delivery this week! You do not need to buy a separate pad for this rug as it has one built in. This rug is fantastic. We have a Labrador who sheds like crazy and takes off on a dime, sending normal rugs flying (even with non-slip pads). This rug washes and vacuums incredibly well and stays perfectly in place. I just ordered my second Ruggable and plan to purchase more. I love these things! Purrrfect rug for a home with pets. I couldn’t have throw rugs before this because washing was impossible. Thanks Overstock and Ruggable for such an innovative product. This is a really nice rug visually!! I love the easy clean up situation! My only annoyance is I got it for my dog room, but the first night my dogs toe nail got caught in the sewn trim. He was completely hooked and kept trying to dangerously pull his paw away. I can’t leave him unattended around the rug, which was the whole purpose of buying it. I've had this rug for several months now and am very happy with it. It looks great in my hallway and washed up really well when it got dirty. The colors are nice and it looks like an expensive rug - until you pick it up! (It's very light weight). Would definitely recommend. Great rug. Its like walking on silk and so easy to clean by simply throwing it in the washer! Used in office space. 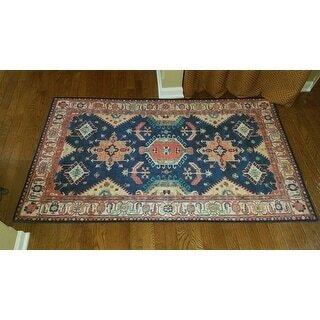 Pleasantly surprised as to rug thickness and great color for the price. I love the color of this rug, and I love that mat that's under it that holds it in place so well. Haven't needed to wash it yet, but I'm so glad that I can!!! I love the color and the fact that you can wash it but I don’t like that the ends curl up. Color fades quickly but holds up well to high traffic areas. Edges curl but responds well to starch and a hot iron! Love this carpet the colors are beautiful and the fact that it can be thrown in the washer and dryer is the best quality of all. A must have if you have pets ! This one was the second one I bough thinking it will be better than the first but no, the colors don't match at all the photo and the quality is not what I expected for the price. 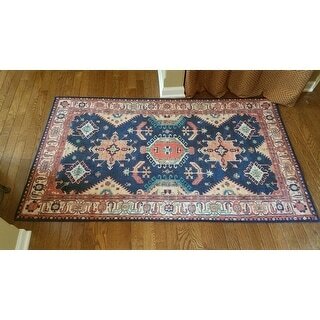 I found cheaper rugs around for better look and quality. "Is this rug heavy enough with the two pieces that an additional no-skid pad is unnecessary?" No additional rug pad or purchase is necessary.